You will have 7 minutes from the bell at the start of class. The Words are at the bottom of this page (scroll down). Classwork: Read "The Death of Balder," straight through once. Then, read through the story a second time, and answer the Reading and Research questions, to the right. Odin, the king of the Norse gods, often sat upon Hildskialf, the throne of the Aesir gods, with his companions, the two ravens, Hugin (thought) and Munin (Memory), whispering in his ears. From this position he could look out on all of the nine worlds. Sometimes his wife Frigg would sit there, too, but she was the only other god who was so privileged. Frigg was the second and favorite wife of Odin, whose daughter she may also have been. She was the only Aesir as clever and knowledgeable about the future as Odin, although her foreknowledge did not depress her as it did her husband. Frigg had her own palace, which was known as Fensalir, where she sat spinning clouds to float above Midgard. Fensalir also served as the afterlife home for married couples who wished to be together. It was a counterpart to the famous home of valiant warriors, Valhalla, where Odin spent much of his time -- drinking (he is said to have stopped eating when he heard about the inevitable doom of Ragnarok) with his feasting and fighting companions and the Valkyries. The most handsome of the gods was born to Frigg and Odin. He was named Balder (also known as Baldur). He was a god of truth and light. Balder was also knowledgeable in healing herbs and runes, which made him a favorite among the people of Midgard. Balder lived in a palace named Breidablik with his wife Nanna (n.b. there is also a Mesopotamian goddess of this name), a vegetation goddess. It was believed that no lie could pass through the walls of Breidablik, home of the god of truth, so when Balder started having frightening nightmares about his own demise, the other Aesir gods took them seriously. 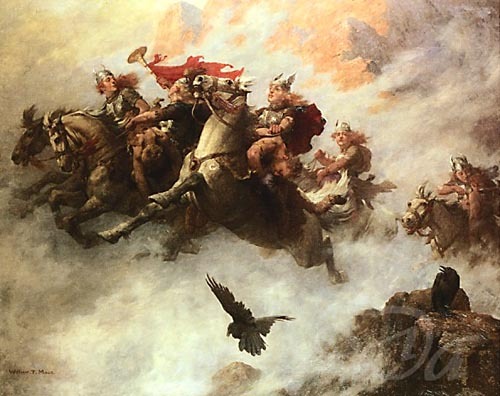 Unlike gods in other pantheons, the Norse gods were not immortal. They catalogued everything that might possibly cause Balder harm, from weapons to diseases to creatures. With the list in hand, Balder's mother, Frigg, set out to collect promises from everything in the nine worlds not to harm Balder. She asked every item, large or small, to promise not to hurt Balder: rocks, mountains, streams, animals, trees - every little thing, except one, which she considered not dangerous in the slightest. Her actions have of course resulted in comparisons with the Greek minor goddess, Thetis. When she had completed her mission, Frigg returned to Gladsheim, the gods' meeting hall, for a celebration. After a few rounds of drinks and toasts, the gods decided to test Balder's invulnerability. A pebble thrown at Balder bounced off without hurting Balder, in honor of its oath. Larger weapons were used, including Thor's axes, and all refused to hurt the god. Frigg's actions, and Balder's invulnerability draws comparisons to the Greek hero, Achilles. Loki is known as a trickster god. Sometimes he was mischievous, but he hadn't really been malicious. The giants were evil, but Loki, who was the son of a giant, hadn't been known as such. It seems his self-appointed job was to stir things up when things were going well. He is what we would now call a "trouble-maker." Loki was disturbed by all the joy surrounding Balder and decided to do something about it, so in disguise as a disgusting old hag, he went to Frigg while she was at Fensalir taking a break from the festivities. What was going on at Gladsheim, he asked her. She said it was a celebration for the god Balder. Loki-in-disguise asked why, then, were people throwing weapons at him? Frigg explained about the promises she'd received from all things in the nine worlds. Loki kept at her asking questions until she finally revealed that there was one thing she hadn't asked because she thought it too small and inconsequential. That one thing was mistletoe. With all the information he needed, Loki set off to the forest to get himself a branch of mistletoe. 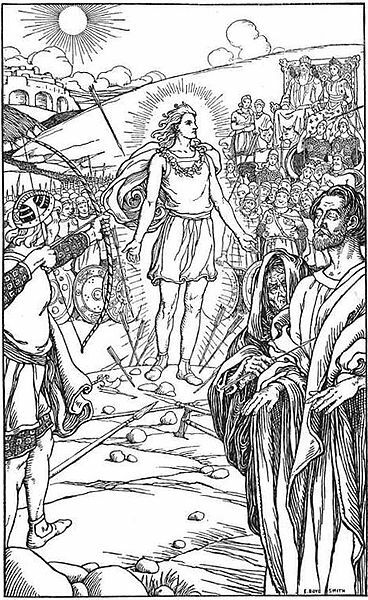 He then returned to the festivities at Gladsheim and sought out Balder's blind brother, Hod, god of darkness, who was in a corner because he couldn't aim and therefore couldn't participate in the test of Balder's invulnerability. Loki told Hod he would help him take aim and handed Hod a piece of apparently harmless mistletoe to throw. Celebration turned to sadness since the most beloved of the gods had died. Odin alone was aware of how disastrous this event really was for them all, for he knew that with the loss of light and truth, the end of the world, Ragnarok, was due soon. An attempt was made to resurrect Balder, but due to more of Loki's mischief, it failed.The goddess of death, Hel, promised that Balder could return to earth if every living creature shed tears of grief for Balder. It looked as though it would work, for everyone loved Balder, but Loki arranged for a single exception. Loki disguised himself as the giantess Thok. As Thok, Loki was too indifferent to cry. And so, Balder could not return to the land of the living. Balder and his wife remained in Niflheim. Another son of Odin, Vali, revenged the death of Balder, but not by getting back at Loki. Instead, Vali killed his brother, the blind god Hod. Loki, who had fled the initial scene of Balder's death in Gladhseim, and then re-appeared in disguise as the giantess Thok, tried to get to safety by turning into a salmon. The salmon-Loki hid in a waterfall. But the Aesir, who knew where he was, tried to catch him in a net. Loki was too clever for that and jumped right over the net. Thor, however, was fast enough to catch the leaping fish in his bare hands. Then Loki was bound, (Prometheus-like) in a cave with venom dripping onto his body, which caused him to writhe in pain -- until the world's end in Ragnarok. Homework: study these words for the quiz!